The Burrito Bar at Breeze Hill is located in Lansing, West Virginia, just two miles north of Fayetteville. After a day of whitewater rafting on the New or Gauley River or rock climbing in the New River Gorge come take a seat at The Burrito Bar for a burrito, a view, and a cold beverage. From Fayetteville head north on highway 19. Take the second right after crossing the bridge onto Lansing-Edmond Road. Take the second left onto Oscar White Road. You will soon pass New and Gauley River Adventures outpost then see a sign for The Burrito Bar at Breeze Hill in front of the historic home which houses the restaurant. From Summersville/Route 60 head south on highway 19. Approximately four miles after the route 60 intersection take a left onto Lansing-Edmond Road. Take the second left onto Oscar White Road. 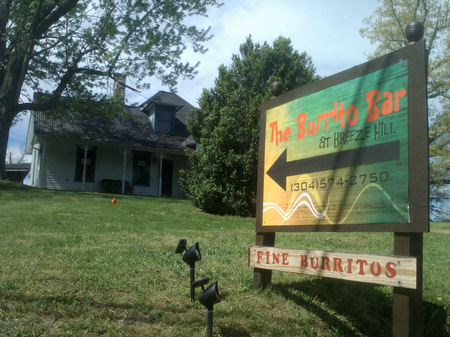 You will soon pass New and Gauley River Adventures outpost then see a sign for The Burrito Bar at Breeze Hill in front of the historic home which houses the restaurant.